The family of a tourist missing in the Swiss Alps have said they are "hopeful" of finding him alive. Myles Robinson, 23, was last seen outside the Blue Monkey bar in Wengen as he took a friend to her hotel just after 0200 (GMT) on Tuesday. His father Michael, of south-west London, said posters had been put up in an attempt to find Mr Robinson. The Swiss army has joined the search which is using helicopters, sniffer dogs and infra-red cameras. His sister Cara, 25, said: "We've heard absolutely nothing since then. It's a total mystery." She said her family could think of no reason why he would suddenly disappear. "He's been coming here for about 15 years. He knows the region, he knows the locals. "He's a normal boy. He would never wander off. We are a really close family." Mr Robinson was wearing jeans, a white shirt, dark jumper and jacket when he was last seen. He had been holidaying with his sister and parents Michael and Sarah, of Wandsworth. 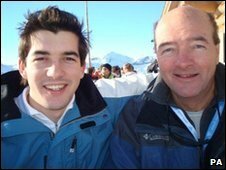 The missing man's father said: "A body has not been found yet so we are trying to remain hopeful." He added: "We have held meetings in the town, put posters up, and are just hoping he will be found."